As we hurtle through the final week of August, I find myself grappling with the same question I do every year at this time: Where the hell did the summer go? In this most fleeting of New England seasons, this is usually the point at which I take stock of all the summertime plans I made back in the spring and realize that I have only a matter of days to accomplish the remainder of them. That said, if I’m going to get to the beach, do some kayaking, explore the Boston Harbor islands, play some mini golf, go to a few Sox games, spend a weekend at the Cape, and host a cookout before Labor Day, then it’s time to get crackin’. One thing I’ll definitely find time for as summer approaches its unofficial finale is enjoying a few drinks al fresco. 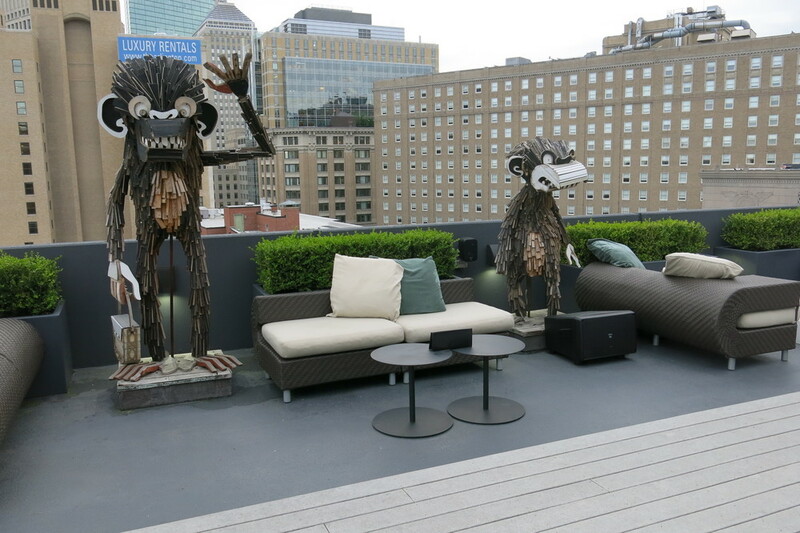 So for the final installment of the 2014 BBH Outdoor Seating series, we’ll hit up a few Boston roof decks. As you may recall, I already did a rooftop-themed story a couple of summers ago. But let’s face it – sipping drinks a few stories from the ground is a novelty that doesn’t quickly wear off. And how could it with views like this? As much as I try to avoid writing about chains here on Boston BarHopper, it’s hard to resist the allure of Legal Harborside. Two outdoor patios and a lounge enclosed by glass walls offer sweeping views of Boston Harbor and the city itself. The outdoor areas tend to fill up quickly, but they’re fairly spacious, with wicker furniture sets and plenty of stools lining the perimeter of the deck. If you can’t find a seat outside, you can still enjoy the view from indoors. Guests tend to make a beeline for the comfortable leather couches by the windows, but with a long mirror behind the 15-seat bar that reflects the harbor, you can watch sunsets and sailboats from almost any vantage point. And you can enjoy those views year-round from the comfort of the indoor lounge – just one benefit of having a retractable roof. The drink list is what you’d expect of an upscale chain restaurant, with a decent variety of specialty drinks and some seasonal offerings. I started with the Red Sangria, which was way too sweet. With red wine, peach liqueur, citrus and raspberry rums, fresh citrus, and lemon-lime soda, this was more of a fruity punch than a sangria. Then again, it was a generous pour in a big glass, so I can only be but so critical. I figured the Harpoon Mango IPA would be too sweet as well, but I was pleasantly surprised. If I’m not mistaken, this unusual Harpoon variety is specially made for Legal Harborside, and it’s a pretty solid IPA with a mild fruitiness. A crisp but refreshing beer, I could easily throw back a few of these while watching the sun disappear behind the surrounding buildings, bathing the roof deck in a warm, amber glow. 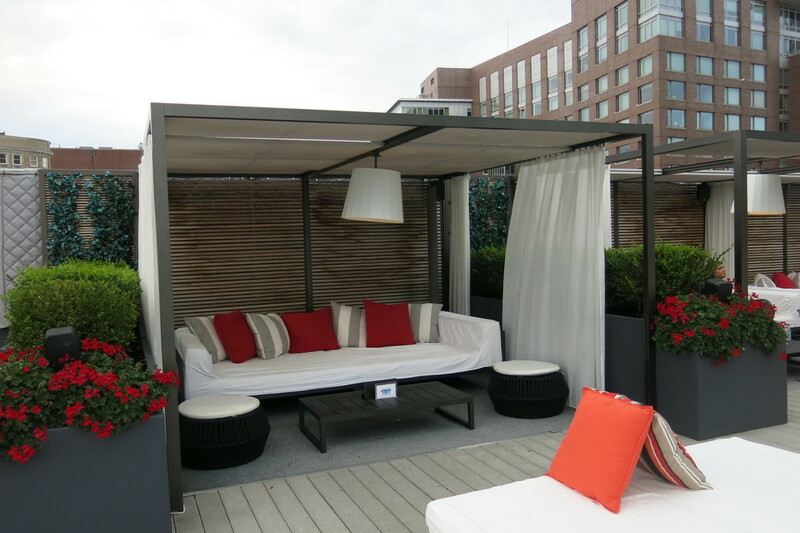 While a seafood restaurant by the water might be the most traditional of summertime New England settings, the Revere Hotel goes for modern and trendy with its rooftop bar. 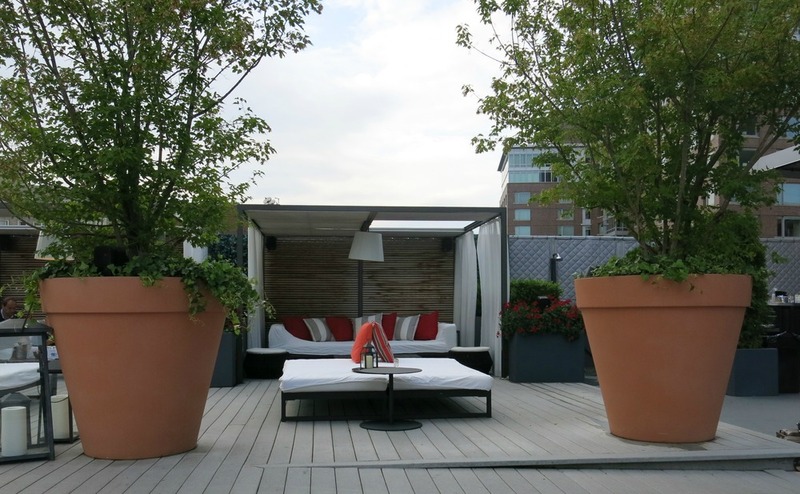 With a striking red and white color scheme and panoramic views of the Boston skyline, the Rooftop at Revere offers sophisticated comfort for a crowd that blends well-dressed professionals with hotel guests in bathing suits, availing themselves of the rooftop swimming pool. All throughout the large, open space are couches, chaise lounges, and even a few cabanas. Enormous potted plants contribute a little greenery, and a few bizarre sculptures provide…ambience, I guess. 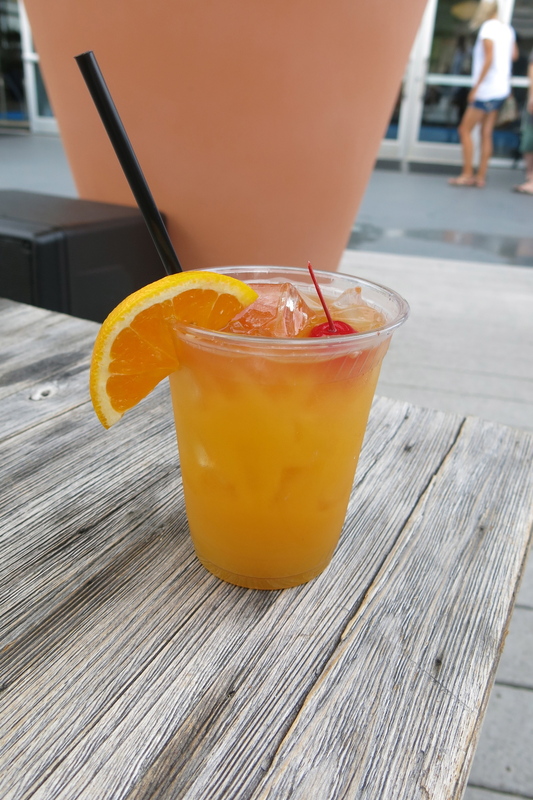 The Revere’s drink menu is clearly geared to summertime imbibing, with colorful, fruity drinks that hit the spot after a dip in the pool or while watching the sun go down. I was expecting the Passion Hurricane to be little more than poolside fare, but was taken aback by an unexpected sour component. While grapefruit juice wasn’t listed among the ingredients – Bacardi Gold, a combination of passion fruit, lime, orange, and pineapple juices, and Angostura bitters – I’d swear it was in there. Whether by design or mistake, the phantom grapefruit balanced out the sweeter juices and made for a surprisingly complex warm-weather cocktail. And yet the Hibiscus Punch was considerably sweeter than I was anticipating. Made with white rum, aged rum, ginger liqueur, hibiscus tea syrup, and fresh lime juice, I was expecting a more noticeable herbal tartness from the tea. Still, it was easy-drinking and refreshing on a warm summer evening. It’s not as stylish as the Revere or as spacious as Legal. The view of Cleveland Circle is a little short of breathtaking. But Brighton’s Cityside Bar exudes the sort of laid-back, unpretentious charm that you can only find at a well-worn neighborhood pub. Cityside’s not a destination for lobster, craft cocktails, or subdued house music; this is where you go for oversize pitchers of beer, karaoke, and Sox games on TV. But what immediately sets Cityside apart from most neighborhood bars is its roof deck. Long, narrow, and populated mostly by two-person tables, it’s a cozy space with bright red umbrellas that keep the sun at bay. Eschewing the latest cocktail trends, Cityside’s drink list generally favors sweet, potent, and colorful over small-batch spirits and exotic mixers. But on a sweltering summer afternoon, sometimes there’s nothing better. I started with the Classic Margarita, which cost me a mere $6. It was a pretty standard, no-frills margarita, and it certainly hit the spot. The Hurricane is a loose interpretation of the Bourbon Street classic, made with dark rum, amaretto, grenadine, orange juice, and pineapple juice. A sweet, guilty pleasure. The Pineapple Express is basically a pineapple mojito. With muddled mint and lime, it made for another thirst-quenching drink on a hot day. Cityside’s food menu is straightforward but surprisingly extensive, with a solid variety of appetizers, sandwiches, and burgers. The California burger is topped with bacon, cheese, and fresh avocado. 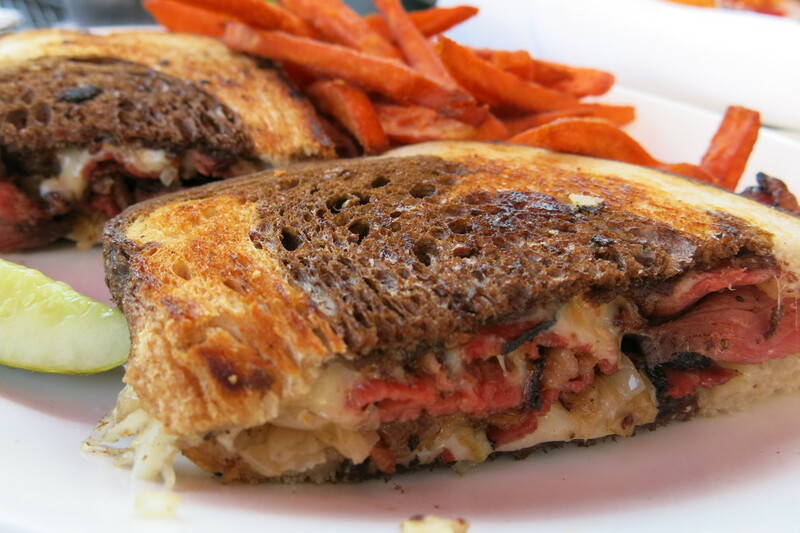 The pastrami Reuben melt combines the best of both sandwiches, with a generous portion of lean pastrami, Swiss cheese, sauerkraut, and Russian dressing. Remarkable? No. Satisfying? You bet. So, there you have it. Another summer in the books. In the coming days, vacations will end, students will be back in full force, and the days will start getting noticeably shorter. But with any luck, the pleasant weather will extend long past Labor Day weekend. And even if you can’t cram in all your remaining summertime plans before the leaves turn, there’s still time to eat and imbibe outdoors. Before you know it, the patio furniture will go into storage and the roof decks will close, so make the most of the season while it lasts. I dropped the ball. After publishing an outdoor seating story in June, I promised a follow-up in July. But before I knew it, the steamy middle month of summer had come and gone. In a way, I suppose that’s indicative of this fleeting season in New England. But no excuses – it just means twice as much outdoor imbibing in August. So without further ado, we’ll hop on the Red Line and visit a few places in Cambridge. The city on the other side of the Charles is dynamic, unique, and characterized by endless variety. And each “square” in Cambridge has its own distinct rhythm and personality – there are neighborhoods with centuries-old roots, others that are up and coming, and some that are cultural trendsetters. We begin in Kendall Square. Since its 2012 opening, Belly has been defying the notion of what a “wine bar” should be. Instead of dark and serious, it’s bright and airy. In place of the typical cabernets and chardonnays are orange wines and, at the moment, a menu featuring two dozen varieties of rosé. That casual, playful attitude extends to the outdoor patio that Belly opened this summer. Like the interior, the patio is cozy and almost communal, with an eight-seat bar and a handful of bright red tables that sort of look like modern picnic benches. Overhead, strands of lights form an illuminated canopy when night falls. The food menu is as funky as the wine list, with an emphasis on small plates, charcuterie, and house-cured salumi. There are some bold options in the mix, like head cheese, duck liver mousse, and, pictured below, a pork and fennel terrine, accompanied by a spicy mustard. But if your palate isn’t quite that daring, the roasted shallot and walnut spread is heavenly. 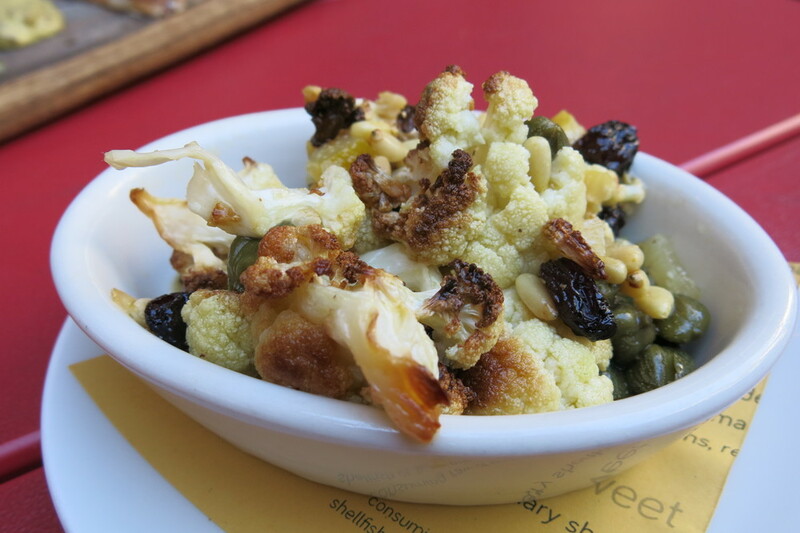 And the cauliflower with capers, pine nuts, and preserved lemon is fresh, crisp, and full of flavor. Wine may be Belly’s calling card, but the cocktail list is no less impressive. The Green Neighbor Policy might be one of the most vividly colored drinks I’ve ever been served. Despite its resemblance to a veggie-based smoothie, this mix of cilantro, rum, and lime is a simple, refreshing cocktail with a natural herbal aroma, well suited to a summer evening. And summer is clearly what Belly had in mind with the Hazy, Hot & Humid. This slow-sipping drink combines Amontillado (as in “The Cask of”), Cava, lemon, and mint. Nutty and full-flavored, with a bit of effervescence, it’s an impressive cocktail and an elegant way to beat the heat. While waiting for a bus after a visit to our next stop, I watched with detached curiosity as a man weaved through a sidewalk full of pedestrians, attempting to sell shaving razors and t-shirts. And by “t-shirts,” I don’t mean short-sleeve outerwear with Red Sox logos or funny sayings – I mean packages of men’s undershirts. “T’s, razors” he kept saying, as if he were a scalper with extra tickets to a Bruins game. What’s more remarkable – within minutes, he actually found a buyer (no, it wasn’t me). Central Square offers more than its share of quirks. And as I’ve said before, it isn’t the most obvious neighborhood in Cambridge to put an outdoor patio. Aside from colorful characters selling toiletries and undergarments, Central is gritty, congested, and subject to a near-constant stream of traffic on Mass Ave. It’s also home to plenty of cool bars, restaurants, and music venues, of course; but for all its diverse, bohemian charm, nothing about Central inspires dining al fresco. And yet somehow, Moksa manages to pull it off. Nestled between the restaurant and the Central Square Theater, Moksa’s small, brick-lined patio is set back from the street and feels comfortably enclosed. There are about 10 tables with rattan chairs, and the atmosphere is surprisingly peaceful. I’m sad to report that mixologist extraordinaire Noon Summers, the beverage director whom I got to know on many of my past visits to Moksa, has left the Boston area for the perpetually sunny climes of Southern California. But her creative spirit still infuses the cocktail menu, with offerings like the Liberator. This potent, tiki-like drink combines Sailor Jerry rum, mint, chartreuse, and curacao. Garnished with orange and lime, it has some fruity sweetness, but the bitterness from the chartreuse keeps things nicely balanced. There’s also a selection of seasonal drinks, like this sangria. Made with brandy, wine, and fruit compote, this take on the classic summertime libation isn’t too sweet, and the brandy adds a little depth. Yes, I know, it’s indoors. But it was raining on one of my visits, so you’ll just have to imagine how this one would look out on the patio. In addition to the drinks, Moksa offers all-you-can-eat sushi every night from 5 to 7 p.m. I can’t say I’ve tried the sushi here, but the folks at USA Today have good things to say about it – they recently named Moksa one of Boston’s 10 best sushi restaurants. As if craft cocktails and all-you-can-eat sushi isn’t enough, there’s at least one more benefit to sitting on the patio – it’s not too far from the sidewalk, so if you’re having a t-shirt emergency or need to get rid of some five o’clock shadow, you may be able to find a roving vendor. Calling Charlie’s Kitchen a Cambridge institution is an understatement. This humble, beloved dive has been serving Harvard Square for a half-century or so, and one gets the impression that little about it has changed in that time. From the diner-like bar downstairs to the dark, second-floor lounge, this sturdy classic never diminishes in popularity, seemingly immune to food and drink trends or the shifting dynamics of the busy neighborhood it inhabits. Which is not to say that Charlie’s hasn’t seen some welcome additions over the years, and none has been more celebrated than the beer garden that opened in 2008. Tucked away behind the main building, Charlie’s Beer Garden is just as laid-back and divey as its celebrated interior. There’s a small bar with about 8 to 10 seats. In the main area are about 12 to 15 tables, most under protective cover to keep the sun at bay and the elements away. Charlie’s offers a surprisingly impressive beer list, with a decent draft selection and many more options in bottles and cans. 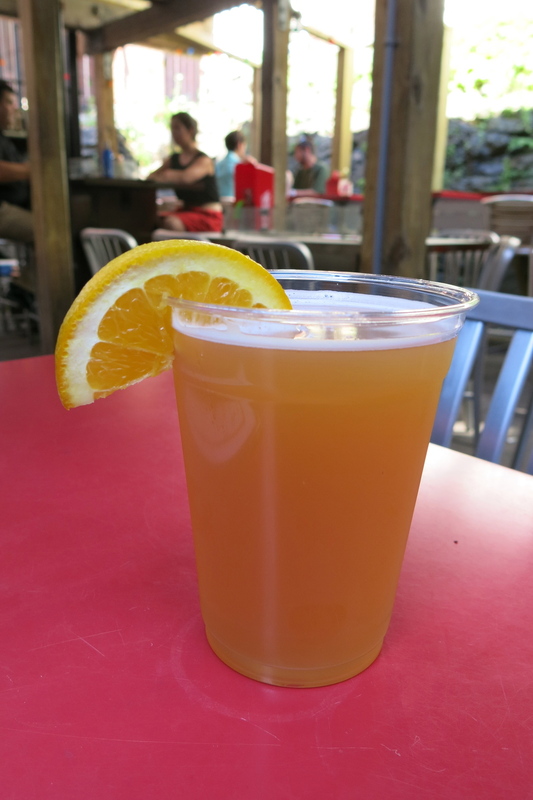 Despite the variety, few beers appeal to me more than a Blue Moon when I’m sitting outside in the summer months. And while Charlie’s’ food menu is more expansive and creative than that of the typical dive bar, the double cheeseburger is a legend in its own right. In a region that has elevated the art of the burger, with restaurants offering creative nightly specials and publications sponsoring near-weekly “best burger” contests, Charlie’s’ burgers win few if any accolades. But in terms of consistency and longevity, few establishments can hold a candle to “The Double Cheeseburger King.” You can dress it up with all the accoutrements you want, but the original version is refreshingly basic – two hamburger patties with cheese, fries on the side – and wonderfully affordable at $5.25. In a city steeped in history, this is one tradition that never gets old. We’re rapidly approaching the midpoint of August, but there’s still plenty of warm weather ahead (right?). For your reading pleasure, I’m hoping to do one more installment of the 2014 outdoor seating series before the end of the month. In the meantime, enjoy the rest of the summer. Statistically speaking, 2013–2014 was not the worst winter New England’s ever seen. There were no real blockbuster storms to speak of. It was a little colder than average, but nothing worthy of the record books. Other parts of the country got it far worse than we did, really. But the true, insidious character of this past winter can’t be expressed in snowfall totals and thermometer readings. Raw data somehow fails to capture the endurance and pervasiveness of the slate-gray gloom that descended on us in October and lingered through much of May. What this winter lacked in blizzards and nor’easters, it made up for in persistent little storms. A few inches here, a few inches there; just enough snow and ice to be a constant nuisance. Every week, it seemed there was another storm in the forecast, along with a bone-chilling cold that arrived early and refused to let up. We stumbled, ungracefully, into spring, and while the gray skies were slow to clear, there were signs that Mother Nature was gradually loosening her grip. In my mania for warmer weather, I celebrated every milestone – the first evening I left the office and noticed that the sun had decided to linger. That glorious morning when I left the house without a jacket. The first weekend when I rolled down the windows and opened the sunroof. The warm weather may have taken its time getting here, but the first full week of summer hasn’t disappointed. And it seems like everyone in the city has gleefully embraced it. There are sailboats and kayaks on the Charles, sunbathers on Boston Common, and picnic lunches in the Public Garden. And with that, it gives me great pleasure to begin the 2014 Boston BarHopper Outdoor Seating Series. I introduced this recurring feature back in 2012, and for whatever reason, never got around to it last summer. This year, I have a renewed sense of urgency and an even greater appreciation for the simple pleasure of eating and drinking al fresco. For the first installment, we’ll hit a few spots in Boston proper. Gather may be best known for its striking interior design, with its wide open spaces, funky hanging light bulbs, and minimalist décor. But in the summer months, it’s the front patio that steals the show. Overlooking Boston Harbor, and offering a splendid view of the city at night, Gather’s patio is ideally suited to casual conversation over good drinks and eclectic cuisine. While Gather offers a respectable selection of local microbrews, the cocktail list seems especially geared toward summertime drinking. Sangrias, lemonades, and tiki drinks abound, like this tall, refreshing Mai Tai. Made with dark and light rums, orgeat syrup, lime juice, pineapple juice, and grenadine, this potent rendition of the tiki classic is fruity but not too sweet. Whiskey smashes are becoming ubiquitous, but Gather’s version is far from typical. Swapping out the traditional bourbon for Bulleit rye gives the Smash a spicy edge, and ginger cognac, combined with lemon and mint, provide an unexpected vibrancy. It’s a slow-sipping cocktail that works well on a warm night. Gather’s food menu has won widespread acclaim for its innovative style and use of locally sourced ingredients. And while it deserves much more attention than I can give it here, I’d be remiss if I didn’t point out one of the highlights of the extensive appetizer list – chicken and waffles. Creating an appetizer version of what is usually a decadent, belt-loosening dish is brilliant. Served with a delicious sausage gravy, each bite-sized piece bursts with flavor. 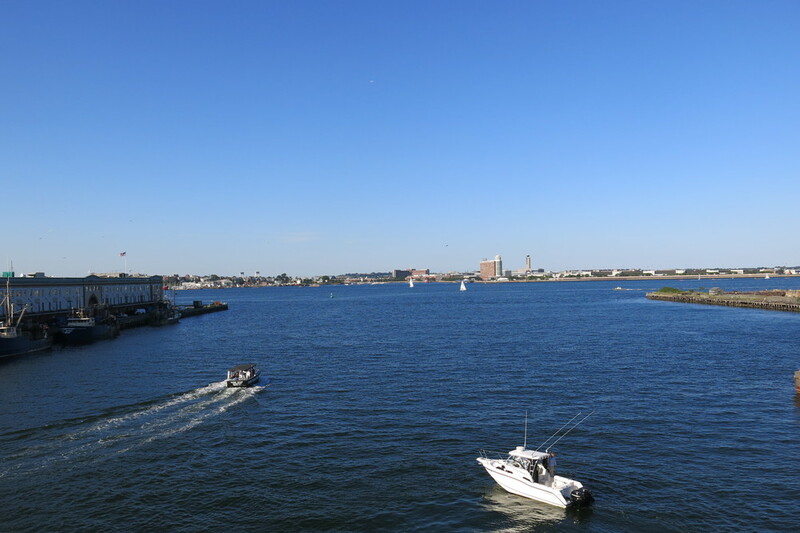 From the edge of Boston Harbor, we head to the heart of Boston. In a city blessed with some truly beautiful scenery, the tightly packed Financial District might not be the most obvious place to put an outdoor patio. Imbibing in the shadows of tall, gray buildings simply lacks the more traditional appeal of drinks by the water or lunch on fashionable Newbury Street. But Battery Park smartly converts a brick-laden alley into a long, comfortable patio that serves as a little oasis amid the banks, law firms, and brokerages of Boston’s commercial epicenter. There’s a small service bar along with 15 to 20 tables and plenty of standing room. Surrounding buildings tower over the patio, but they also offer shade, keeping things cool on a hot day. Battery Park offers a pretty decent beer selection, with some local favorites on draft and a few harder-to-find craft brews in cans and bottles. (I’d skip the overpriced cocktail menu.) I used the occasion of my recent visit to have my first Harpoon UFO of the season. With its notes of citrus and spice, I’ve always found this crisp, easy-drinking beer to be perfect for the summer months. I hadn’t intended to have anything more than the UFO on this particular evening. But as I was perusing the beer list, I was suddenly taken aback by one of the draft options – Natural Light, for a modest $2. “You guys really have Natty Light on draft?” I asked. The waitress assured me it was no joke. “And a lot of people get it,” she added. For $2, I was only too happy to join their ranks. A flood of hazy, college-era memories came rushing back as she presented me with a pale beer in a clear plastic up. I honestly couldn’t recall the last time I had a Natty Light. And with one sip, I remembered why. Few things herald the arrival of summer in Boston like the onslaught of tourists. Inevitably, they flock to Faneuil Hall, the historic marketplace that we locals generally avoid. But while out-of-towners are busy drinking at Cheers and taking pictures with Red Auerbach, they might not take notice of a nearby Financial District bar with a patio that overlooks this bustling hive of tourist activity. What’s immediately striking about the patio at Sterling’s is its size. 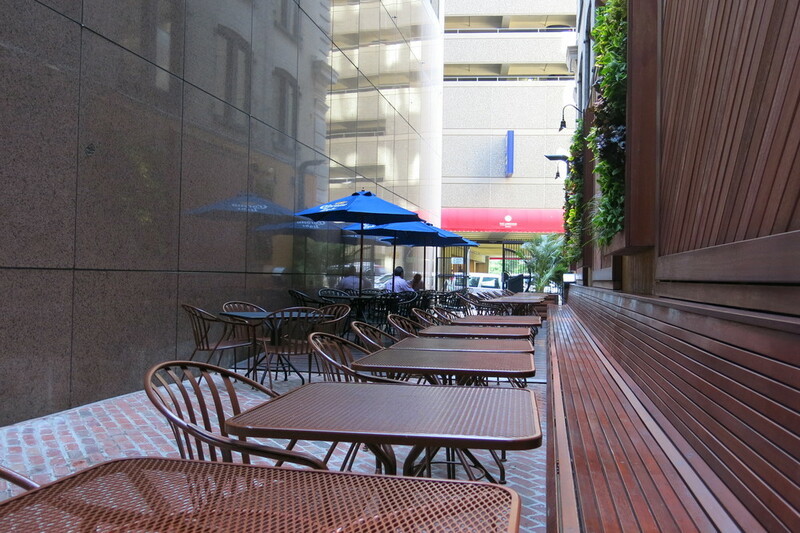 While most Boston bars have to make use of limited available space for their outdoor seating areas, Sterling’s has a large section of 60 State Street all to itself. Even better – they have a dedicated patio bar. Outdoor seating isn’t hard to find in Boston, but freestanding outdoor bars are comparatively rare. Sterling’s’ 20-seat bar even has three flat-screen TVs, making it the ideal spot for whiling away a summer afternoon. Along with a solid beer list and some seasonal offerings like sangria, Sterling’s’ regular cocktail menu offers a mix of house drinks and time-honored classics. 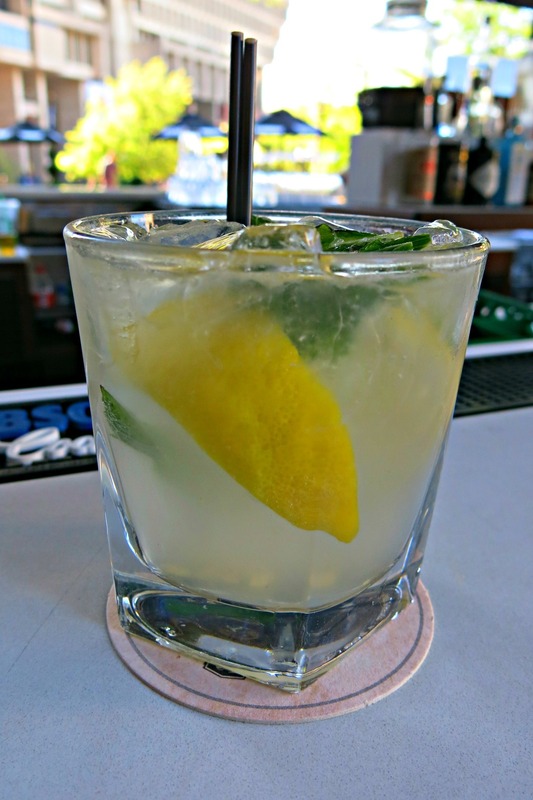 The Southside Sling combines gin, fresh mint, lemons, and simple syrup, making for a refreshing warm-weather drink. And while it wasn’t advertised, the bartender told me about one of Sterling’s’ summer specials – $3 bottles of Red Stripe. I’ve always had a soft spot for this beer; maybe it’s the diminutive bottle, I don’t know. Regardless, it’s a good beer and great deal at $3 (and in terms of quality, makes me think the $2 Natty Light was overpriced by about $1.50). If you’re hungry, Sterling’s also offers a small menu of happy hour specials, Monday through Friday, from 3 p.m. to 6 p.m. Wings, sliders, and the like are available for $6. It’s not the hippest or sexiest new spot. The view from the patio isn’t exactly breathtaking, though the massive construction project across the street doesn’t help in that regard. And if, like me, you work anywhere within the vicinity of Government Center, you’ve probably had after-work drinks here often enough to take it for granted. And that’s too bad, because in the past decade-plus of shifting trends and countless bar openings, Kinsale has not only endured but thrived by sticking to a pretty basic formula – an expansive, accessible selection of microbrews and a broad menu of above-average pub food. But I’m not here to praise Kinsale’s longevity or to examine its bona fides as an Irish pub. In fact, I’m including it mainly for personal reasons. As I mentioned, my office is nearby, and almost every day, I take a walk at lunchtime. On the way back to work, my route typically leads me past Kinsale; and in the summer months, walking by that patio is pure torture. As I enjoy the final minutes of fresh air and re-focus my attention to the second half of the workday, I can’t help but notice the droves of people filling up the Kinsale patio. Some are just on their own lunch breaks, of course, but plenty others are in shorts and t-shirts, sipping beers, devouring heaping piles of nachos with friends, enjoying their day off. Ah, what I wouldn’t give, just once, to make a detour and blow off the rest of the day. Kinsale’s location in Center Plaza, while convenient, does have a couple of drawbacks. It’s on busy Cambridge Street, so you have to contend with a constant stream of cars, noise, and foot traffic. The view of City Hall Plaza across the street isn’t exactly inspiring, either. But the entirety of the sidewalk is under cover, which means the summer sun won’t roast you and sudden thunderstorms won’t force you inside. And Kinsale’s beer selection is highly respectable, stocked with plenty of local and regional brews and all the old standbys. Portland’s Peak Organic Fresh Cut is a crisp, dry-hopped pilsner, but with its pronounced hoppy character, seems more like an IPA. Otter Creek Fresh Slice is a white IPA. Its mild citrus notes make it a pleasant, drinkable summer beer, but it’s hoppier than one might expect. As with Battery Park, Kinsale’s more of a beer bar than a cocktail destination. But their white sangria, an occasional summertime special, is a big hit. And if you do want a classic drink, of course they can whip one up for you. Given its proximity to my office, I tend to think of Kinsale as little more than a place to have lunch or an after-work drink. But nighttime visits to the patio can be surprisingly charming. Eventually the traffic dies down and the crowds thin out, making the general atmosphere a little mellower. And when the bar’s floor-to-ceiling windows are open, you can watch the Sox or World Cup from your outdoor vantage point and hear the live music emanating from inside the bar. Honestly, not a bad way to spend an evening. You know what’s worse than walking by Kinsale’s busy patio on a summer day? Walking past it in the fall. In September, I notice the crowds starting to dwindle. By October, most people are eating indoors. And then, one day, without ceremony or fanfare…the patio’s gone. The chairs and tables are put into storage for the winter, just as they are at Sterling’s, Battery Park, Gather, and at bars all over the city. The calendar says we have a ways to go before that happens, but you know how fleeting the New England summer can be. So savor every moment. This year, as much as any other, we’ve earned it. The first installment of the Outdoor Seating series was all about the view. From the upscale, open-air patio at RumBa to the casual, spacious roof deck at Whiskey Priest, there’s more than one way to enjoy drinks and sweeping water views, whatever your mood or budget. And it’s not just about staring at a body of water while you imbibe. It’s about doing so in a place that feels far removed from the city with its attendant noise, traffic, and crowds. Fresh air and nice weather don’t hurt, either. 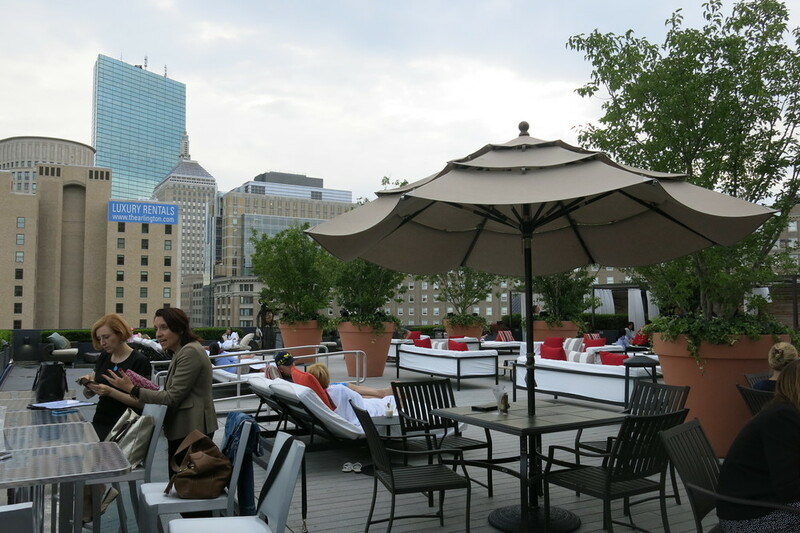 But waterfront bars aren’t the only way to drink alfresco and still escape the commotion of the city; you can find more than one outdoor respite even in the busiest areas of Boston. Those alternatives may be a little difficult to find – in fact, with regard to each bar in this week’s post, at least one person I talked with said, “I didn’t even know that place had outdoor seating.” With that in mind, we move further inland this week and check out a few bars with back decks and patios – some in places you’d least expect. Central Square in Cambridge is about as far as you can get from the waterfront, and I don’t mean geographically. Central’s an interesting place. There’s a lot of shops, a lot of restaurants, a lot of bars, a lot of things to do – but mostly, there’s just a lot of stuff there. The area is very dense; picture an endless stretch of tightly packed store fronts and a constant stream of traffic (not that the latter should distinguish it from most places in the Boston area). Don’t get me wrong, Central’s a cool, hip area, but in terms of Cambridge neighborhoods, it lacks the color and richness of, say Harvard Square. That’s what makes the back patio at The Field such a find (though ask our friend Kayti what a “find” it is, since she had so much trouble finding it). Tucked down a side street, The Field is just far enough from Mass Ave. that it feels a little out of the way, and the inside is comfortably well-worn, homey, and familiar. You probably wouldn’t even think to go through the black exit door at the back of the bar unless it was already open. But when you do, you find yourself in an unexpected oasis in an otherwise busy area. The back patio at The Field offers a surprising dose of fresh air and a sense of distance from the noise of Central. Enclosed by adjacent brick buildings and red garden walls, sitting back here allows you to forget about the cars and the foot traffic for a little while. Plants and flowerbeds offer a hint of nature and a marked contrast to Central’s gray, urban landscape. The patio is a relatively small area, but it’s not jam-packed with tables, and it seems larger because of the open space. There’s also a good-size TV if you need to keep up with the Sox or whatever else is going on. I stopped in on a Saturday night with a few fellow barhoppers – my sister Kelly and our friends Kat, Jen, and, once she found the place, Kayti (in The Field’s defense, I’d attribute this more to user error than the actual hiddenness of the bar). There were about 20 people outside at 7:30, but we had no problem getting one of the 9 or 10 tables. The Field sports a pretty respectable list of draft beers. They call their Guinness “the best in town,” though I have no idea what would distinguish it as such. We started off with a few Blue Moons, which has become my unofficial beer of summer 2012 (I switched to Magners later just to shake things up). Kayti got a glass of wine, the stem of which she later broke under circumstances I can only describe as mysterious. Add in a plate of chili cheese fries, and our night was in full swing. We enjoyed drinks and good conversation as darkness slowly crept in and the lights surrounding the patio clicked on, setting a perfect summer night mood. So if you find yourself in Kenmore on game day, and you need a break from the crowds, you might head over to the patio at Audubon Circle. When I first came to Audubon Circle in April, a couple of things really stood out to me. First, despite its proximity to Fenway Park, it eschewed the sports bar trappings that characterize so many of the bars in this area. Second, I was impressed by its unique ambience – it exudes a refreshing, Zen-like minimalism that I haven’t encountered in many bars in the city. It should come as no surprise, then, that Audubon Circle’s back patio is also unlike any other in Boston. It reflects the same simple, calm atmosphere that defines the bar. Granted, given Audubon’s general vibe, I wasn’t exactly expecting loud music, plastic tables with colorful umbrellas, and a menu of sugary margaritas. But I was impressed by the degree to which, even on a sunny August day, the essence of the bar’s dark, calm interior seemed to extend to the back patio. Audubon’s patio is a small area, enclosed by dark brown wooden fencing, similar in color to the hardwood inside the bar. What’s most striking, though, are the tall bamboo plants that surround the patio, giving the area an unusually serene look. There are six small tables and one large one, with concrete tops that add a stone-like earthiness to the picture. I stopped in for lunch on a scorching Saturday afternoon. The Sox were playing later that night, so Kenmore was relatively quiet at that point, and Audubon was sparsely populated. The heat and humidity might not have made sitting outside an obvious choice, but I was undaunted (anything for the blog). A cold Sam Summer provided a much-needed antidote from the heat. And while I sipped my beer and contemplated my surroundings, I noticed that the bamboo plants did more than just offer a unique outdoor décor – in place of table umbrellas, they kept the afternoon sun mostly at bay. Add in a soft summer breeze and a Kobe beef hot dog, and my trip to Audubon made for one pleasant afternoon. From Kenmore we head down Commonwealth Ave. to Allston. Yes, Allston. It might not be the most obvious destination for outdoor seating; like Central, the sprawling urban terrain won’t prompt you to say, “Ahhhh, what a great place to experience a little fresh air and bask in some lush scenery.” Then there’s the small matter of the billion or so college students who reside there, making you feel elderly every time you step into an area bar. But don’t be so quick to dismiss Allston – especially in the summer, when school’s out and the student population is thus greatly diminished. And while, students or no, the prospect of eating and drinking outdoors in this gritty neighborhood might not seem overly appealing, there are a couple of places worth checking out. We start with Deep Ellum. It’s a small, dark bar that attracts a customer base with an elevated palate for beer. And while Deep Ellum is known far and wide for its top-notch selection of craft brews, surprisingly few people know about its comfortable back deck. Enclosed by dark wood and brick, Deep Ellum’s outdoor area echoes its interior’s aesthetics but not necessarily its atmosphere. For all the good things I can say about drinking indoors at Deep Ellum, it also tends to get very loud in there, even when it’s not crowded – which it usually is. And when it’s a full house, just moving around can be a challenge. The back deck stands in stark contrast. It’s not a large space, but it feels very open. There are 15 to 17 small tables with metal chairs, and a wooden bench running around the perimeter. Flowers and plants, along with vines crawling up the brick walls of the adjacent buildings, give it a garden feel. Large orange umbrellas cut down on the sun, and a few surprisingly powerful fans keep the space pretty cool. Kelly graciously offered to accompany on my recent Allston tour, and we stopped by on a Saturday afternoon. There was a surprising number of people inside, but only a few on the back deck. We grabbed a corner table and began perusing the extensive beer selection. Deep Ellum’s draft beer list is second to none; this is not the kind of place you come to for a Bud Light. The beer menu is heavy on Belgian offerings, half of which I wouldn’t even know how to pronounce, like Brouwerij Van Honsebrouck (I could handle the “Van” part). I opted for a Mayflower Summer Rye, Mayflower having become one of my favorite breweries in recent years. Light, crisp, and refreshing – not a bad choice for a hot summer day. While I’ve always thought of Deep Ellum as a destination for great beer, I recently learned that their cocktails aren’t too shabby either. Kelly went with one called Summer in Sao Paulo – Germana aged cachaca (a liquor made from fermented sugar cane, popular in Brazil), honey ginger syrup, mint, and lime. It was reminiscent of a mojito, but cachaca in place of rum gave it a noticeably different flavor. Sweet, cold, and ideally suited to the sweltering weather. Deep Ellum would thrive even if they didn’t serve food; the fact that they offer an excellent menu is just a splendid bonus. I’ll speak more to that in a future review, but on this trip, Kelly and I got deviled eggs. They come four to a plate and incorporate a little variety – two are Deep Ellum’s standard recipe, and two are part of a rotating daily special, which in this case was truffle oil and garlic. (This makes Deep Ellum the only place I know of that has a daily deviled egg special.) Once a summer picnic staple, they were well suited to our garden-like surroundings. My last selection is probably going to make you laugh. Like me, you’ll probably be astonished to learn that Allston’s White Horse Tavern, a quintessential “college” bar, actually has outdoor seating. Well, they do. 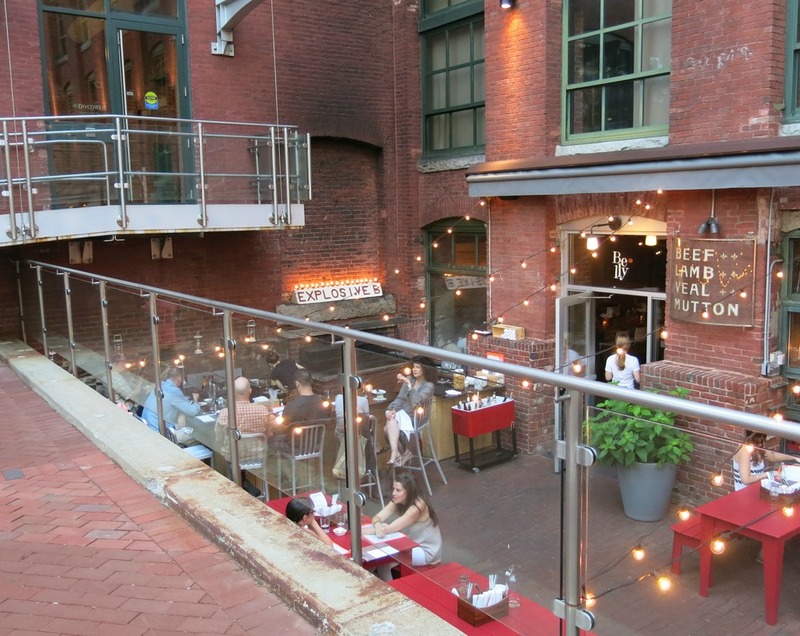 And I have to admit…in terms of patios and back decks in Boston, it’s one of the best I’ve been to. When I mentioned that I was headed to White Horse Tavern for a review, most people giggled and said, “Wow, I haven’t been there since…” If you’re past the age of, say, 25, White Horse feels like the last page of a chapter long closed. And your memories – however fuzzy – are probably something like this: a dark, somewhat dingy room; burgers, nachos, and cheap beer; a big group of friends; and a rowdy night climaxing in a round or two of shots. Sound about right? I certainly have no issue with White Horse Tavern, but I can’t say I would have paid them a visit had I not heard about the back patio. And my expectations weren’t terribly high. I figured, “Well, I’m going to Deep Ellum anyway, I’ll walk up Brighton Ave. and have a look; what have I got to lose?” I wasn’t even sure White Horse truly had outdoor seating. Apart from my general incredulity, I found no mention of this on their website, and it wasn’t until set foot out the back door that I was truly convinced – and pleasantly surprised. The back patio has its own bar, covered by an enormous, retractable awning that suitably blocks out the sun. There are about 15 wicker chairs, and two large TVs that were showing the Olympics when Kelly and I were there. Aside from the immediate bar area, there are 10 to 15 tables of varying size, most protected by blue Sam Adams umbrellas. There are two beers on draft – Sam Summer and Harpoon Red Paint, which is a British IPA brewed exclusively for the owner of White Horse and his other bars. There’s also a full liquor offering, along with the regular food menu from indoors and a separate “patio menu” of mostly extended appetizers – tater tots, that sort of thing. Exactly what you’d want to snack on while sipping drinks on a summer afternoon. Enclosed by wooden fencing with hanging flower baskets, this is an attractive setup. And I’m told it looks really cool at night, when the lights come on. I have to say…this is not the White Horse I remember. I made a beeline for the Harpoon Red Paint, which is poured via a neat paintbrush tap handle, while Kelly went for Sam Summer. The bartender, Jessie, took great care of us, and when I explained my purpose in being there, happily told us all about the bar, the patio, the food specials, the nightly events, you name it. As I looked around the patio, perused the extensive menu, and chatted with Jessie, I started to get the impression that the reputation of being “just a college bar” rankles the staff somewhat – and I think they’re attempting to broaden White Horse’s appeal. Just investing in this patio (which has apparently been open for a few years) shows a willingness to upgrade a place that could easily thrive year-round as a simple dive bar. But it’s not just the back patio that make me think White Horse would like to shed its old identity as a burger-and-cheap-beer hangout. For starters, having a beer brewed exclusively for your establishment by Harpoon tends to set you apart from other Allston bars. What really sealed the deal, though, was when Jessie persuaded us to visit the “Lemonade Stand” section of the drink menu. It’s a selection of alcoholic lemonade cocktails that Jessie exuberantly insisted we try. Since she came up with one of the recipes herself, and because it was a perfect day for a cold lemonade, how could we say no? 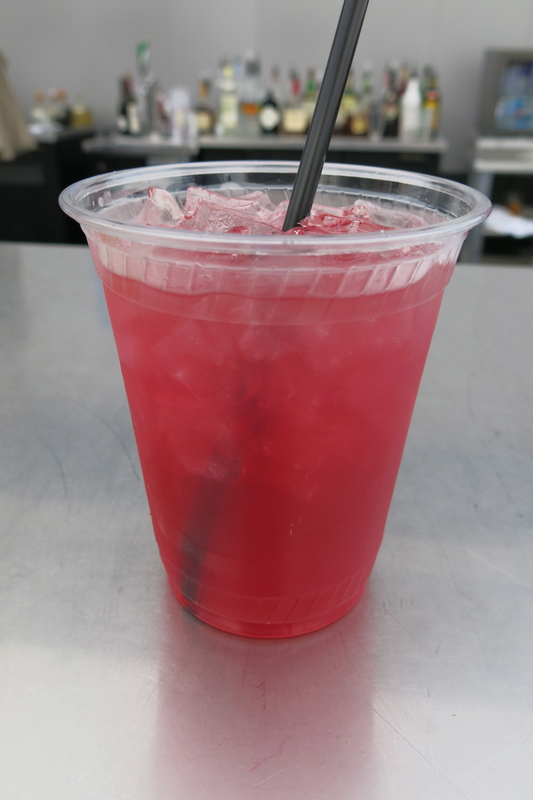 Now, when a bar that traditionally caters to the college crowd offers a “lemonade drink,” what do you figure it will be? Some artificial, sugary mix thrown in a blender with ice and cheap vodka. Gut rot and the promise of a wicked hangover. But at the White Horse back patio, the surprises just keep on coming. I watched Jessie whip up a strawberry lemonade the likes of which I’d never before encountered. Freshly squeezed lemons, muddled fresh fruit, served in a Mason jar – a Mason jar! The drink was phenomenal – wonderfully fresh, with a natural sweetness and a rich, thick texture. It felt like there was fruit in every sip, and it was dangerously smooth! I could have sat there for hours with one (or two). Given its proximity to Boston University, White Horse will always be a “college bar.” But that doesn’t mean it can’t try to be more, and from what I’ve seen, the effort pays off. The strawberry lemonade prompted Kelly to remark that their other drinks might be worth a try sometime. Likewise, the experience as a whole made me think…I should really come back here. Sipping cocktails at an outdoor bar on the waterfront makes all kinds of sense. But right smack dab in a busy city? That can be more challenging. As I said earlier, most people I talked with were surprised that the four bars in this week’s post even had outdoor areas. What’s more surprising is how well they work – especially in some of the last places you’d imagine. Of course, that might be because each of these patios or back decks takes you out of your urban environment and offers in its place a peaceful and detached atmosphere. I’m not going to try to say that each one transports you to a whole other place – just peer over the fences and you’ll remember you’re in the city. But when you’re surrounded by tall, green bamboo plants at Audubon Circle or lounging beneath the big canopy at White Horse, it’s hard not feel a sense of relief from crowds, cars, and pavement. Drink prices at all the bars I went to were very typical for the city – $5 to $6 for the beers, $10 for Kelly’s cocktail at Deep Ellum, $9 for the strawberry lemonade at White Horse (and worth every cent). The snacks are reasonably priced, too – $4 for the hot dogs at Audubon, $6 for the deviled eggs at Deep Ellum. Even on the hottest days, all four bars offer some kind of protection from the sun. But twilight is an even better time to visit, when the air cools down, the lights come on, and you can sip a drink and soak up summer while it lasts. Summertiiiiiiiime, and the livin’ is easy… As I mentioned in my Montreal post, sometimes there’s nothing better than sitting outside on a summer evening and enjoying a cold brew or a refreshing cocktail. Maybe you’re unwinding after a long day, having glanced often and longingly out of your office window, wishing you were enjoying the weather. Or if you’re lucky, you’ve got the day off and are just enjoying the city, not adhering to a strict schedule or agenda. Whatever your purpose, sipping a cold one outside is a nice way to kill an hour or spend an evening. But I’ve found that drinking outside in a busy city like Boston can be a mixed bag. A lot of outdoor seating areas tend to be small and cramped, a few tables squeezed onto the sidewalk outside a restaurant. Some places can’t serve you alcohol if you aren’t also buying food. And when the seating area is adjacent to a loud street, conversation can be a struggle. Maybe I’m just being whiny. Or…selective. Regardless, when it comes to imbibing outdoors, I’m always on the hunt for bars that get it right. With that in mind, I’ve been wanting to do a series of posts on bars with outdoor seating – where to find them, which bars do it really well, and so on. I figure I’ll do a few installments as the summer winds down (it pains me to type that, but the calendar doesn’t lie), focusing not just on specific bars but different neighborhoods in and around the city. I don’t intend for these posts to be full reviews of the bars themselves – just a few thoughts on the outdoor sections. Now, when it comes to eating and drinking outside, I think ambience is key. If traffic, trolley bells, and honking horns are your thing, maybe you’ll enjoy a bar that overlooks Commonwealth Avenue or Huntington. If you’re in a people-watching mood, maybe something on Newbury Street. Myself, I can’t think of anything better than enjoying a beverage while looking out on the water. So in our first week, we’ll look at handful of waterfront bars. First up is the outdoor patio at RumBa, the swanky bar at the swanky Intercontinental Hotel. I hear it’s quite an experience inside, but the outside is certainly spectacular in its own right. 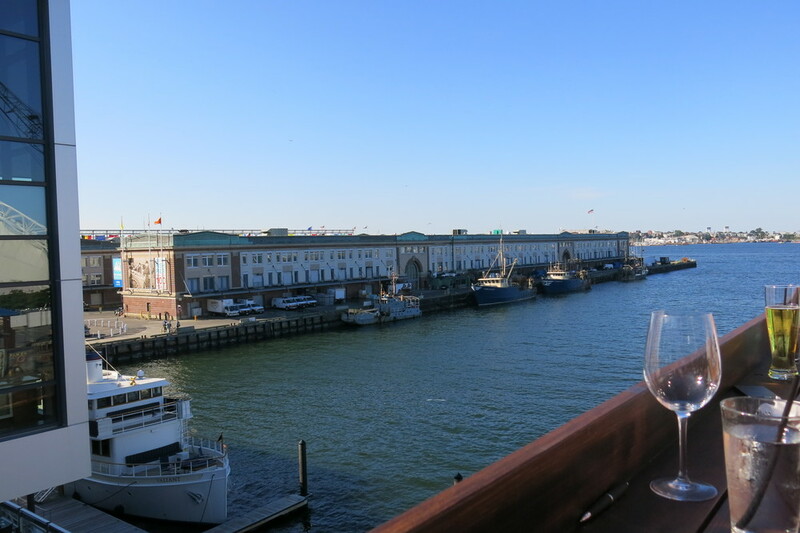 Situated on the Fort Point Channel, the patio offers a gorgeous view while you sip your drink. And a historical one, as it overlooks the site of the Boston Tea Party. Facing the water, surrounded by plush grasses and planters filled with palms, RumBa feels like a patio at a tropical resort, thousands of miles from the hustle and bustle and noise of Boston. There’s an octagon-shaped bar in the center with a dozen seats, surrounded by about 10 tables and a few areas of couch-like seating beneath giant umbrellas. The bar’s name is not an ode to the Afro-Cuban dance but instead a play on the Boston accent – rum bahhhhhhh. Sure enough, the extensive selection of rum they offer can probably rival the wares of any Caribbean island. Peruse the cocktail list, gaze out at the harbor for a while, and you might even forget where you are. You’ll remember when you get the check, though. The Intercontinental is a highly upscale hotel, and you’ll pay accordingly. My Captain and Coke ran me $10; last I checked, that’s just a shot of rum and some Coke. But if you’re on a budget, and still want a buzz by the water, you can always go with beer. At $6, a Harpoon Summer is just a little higher than you’d pay at most area bars, though inexplicably, a Bud Light is also $6. For reasons I can’t wrap my head around, a Stella Artois will run you $7. In case you thought you read that wrong, let me state it again: $7 for a Stella. To be fair, though, you don’t come to a place like this just for a drink – you’re here for a drink and a view you can’t get at most bars in the city. And RumBa feels surprisingly secluded, which is a rare sensation in Boston. The clientele when I visited on a Saturday afternoon seemed mostly to be out-of-town hotel guests and a few locals who can afford to pay $7 for a Stella (I really needed to work that in there one more time). From RumBa, a 5-minute walk along the harbor will bring you to the Alley Bar at Rowes Wharf, part of the Boston Harbor Hotel. Alley Bar doesn’t offer the same sweeping views of the water that RumBa does, given that it’s situated in an alley (hence the name) between the harbor and Atlantic Avenue. But you can still look up and see boats at dock, and detect the salty scent of the ocean that wafts by in the breezy alley. Surrounded by brick walls and the pinkish-red sandstone of nearby buildings, Alley Bar feels like an enormous hotel lobby with no roof. There are about 30 two-person tables with comfortable, high-backed wicker chairs, and a bar in the center of the area with five or six seats. The fire from heat lamps will keep you warm when the summer air carries a chill. I arrived at 5:30 on a Wednesday and found about 20 people there, a mix of hotel guests and guys in suits having after-work drinks. I was greeted by a most pleasant hostess, who told me they were offering samples of Solerno blood orange liqueur. Bittersweet, potent, and tasty, the Solerno was featured in a couple of that evening’s specialty cocktails. Beautiful, dry weather, a free drink sample, and a complimentary oriental mix, complete with wasabi peas. My evening was off to a decent start. Intriguing as the liqueur was, I opted for sangria – a simple but satisfying choice for an early summer night. blackberries, and blueberries, my drink was refreshing and not too sweet, as sangria often tends to be. Delicious as it was, I’m spoiled when it comes to sangria. My friend and fellow barhopper, Ivys, makes the very best I’ve ever had, so I’m not even sure why I order it when I’m out. 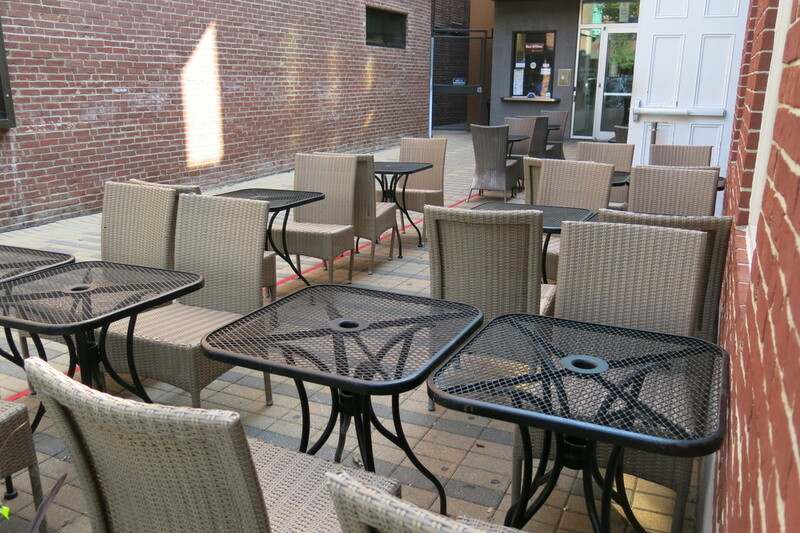 Like RumBa, Alley Bar is the outdoor portion of an upscale hotel bar, with prices to match. Stella will again run you $7 (I…I just don’t get it), Harpoon Summer and Bud Light $6. My sangria was $13, like the majority of their cocktails, but it was an admittedly generous pour. Again, you’re paying in large part for the atmosphere, and Alley Bar’s couldn’t be more relaxed. In a relatively quiet area of the city, and just removed enough from the street so that the sound of cars isn’t a problem, Alley Bar strikes me as the sort of place I’d stop into for an hour on a summer afternoon when it’s a bit too early for dinner. A short walk across the bridge over the Fort Point Channel will bring you to a couple of places that are a little more down to earth. First up is the very popular Atlantic Beer Garden. It’s a favorite stop for people leaving Harpoon brewery tours, and in general, it’s probably one of the first bars that comes to mind when people around here think about having a few beers on the water. And why not? As outdoor seating goes, Atlantic Beer Garden gives you a few different options on its two floors. There’s a decent-size dining area in the front of the bar, along with a deck that runs around the back of the first floor overlooking the seaport. 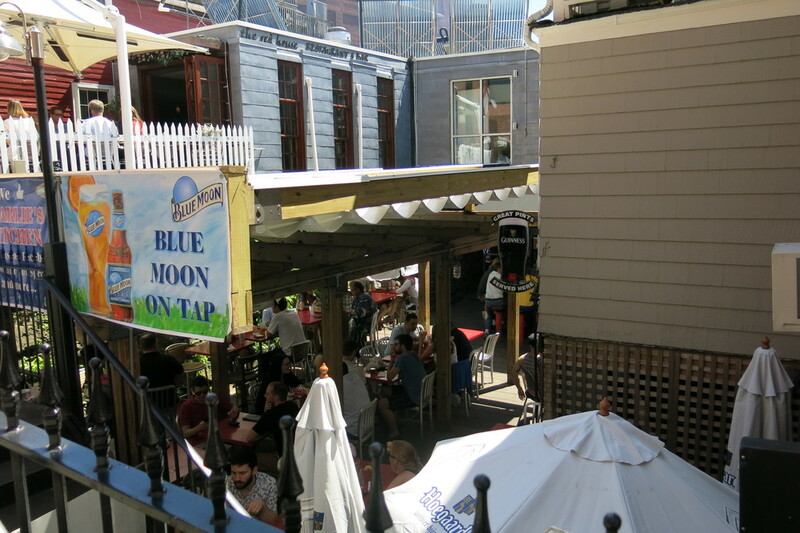 But what most people probably think of is Atlantic Beer Garden’s roof deck. If RumBa conjures up visions of a tropical resort, Atlantic Beer Garden, with its red umbrellas and plastic cups, feels more like a party on a friend’s porch (a friend who lives by the water). Very casual. Also very popular – I don’t think I’ve ever been here and not found it completely crowded. You might find yourself waiting a bit for one of the 15 to 20 tables, and there’s really no place to stand around outside. It would be helpful if there were a bar on the deck, though there is one right inside where you can bide your time. My only other qualm might be one of those “this only happens to me” things, or it could be a peculiarity of the way Atlantic Beer Garden is positioned, but I always feel like I get stuck with a seat where the sun is blazing right in my face. Maybe that’s one of the occupational hazards that accompanies outdoor seating, or it might be because the seaport is a comparatively desolate area, with nothing to block out the sun (though I suppose that makes for some good views). The best way around that would be to visit in the evening; no one ever complains that the moon is too bright. Except burglars. But I digress. Prices are a bit more reasonable here than at RumBa and Alley Bar. You can get a pitcher of something like Blue Moon for about $20, and you’d be wise to do so – again, it’s always packed, so the wait staff is usually in high demand. Right next door is a similar bar called Whiskey Priest. Like Atlantic Beer Garden, it occupies two floors and offers a splendid view. Whiskey Priest’s roof deck is a bit larger and more spread out, though, and it seems a bit less congested than its neighbor’s. There’s more room to walk around, and maybe because of that, it feels a little more laid back. One big advantage at Whiskey Priest is that its roof deck actually does have a bar. This is valuable, because it gives you somewhere to stand and mill about if you’re waiting for a table or simply don’t want one. There are also TVs over the bar, an added bonus you wouldn’t expect to find when you’re outdoors. The beer selection is broad and reasonably priced; I paid $5.50 for a Harpoon Summer, which is standard just about anywhere in the city. Four bars, two on either side of the harbor. They all provide beautiful views while you imbibe, but each has something different to offer. RumBa can transport you to a tropical resort, while Alley Bar still feels like the city but with a sense of waterfront sophistication. I could see stopping by either one for some refreshment on a summer day. They each get their share of tourists, given that they’re hotel bars, and both have a fairly quiet ambience. Atlantic Beer Garden and Whiskey Priest, by contrast, are more your typical Boston bar environment. I can spend (and have spent) entire nights at either place. Atlantic Beer Garden gives you multiple options for outside drinking and dining, while the roof deck at Whiskey Priest feels truly like an outdoor “bar” on account of its…well, bar. But regardless of which of these four most suits your purpose, you’ll be enjoying salty air, warm weather, and a refreshing drink. That makes any of them worth a visit.